Oh boy, these last few weeks has been rough. I was in bed for an entire week and only went back to work from last Monday. I've still not been able to start up any form of exercise through, which is very disappointing. Anyway, life moves on, and here are some photos. We went to the Army Surplus store and Kien insisted on a hat. So we got him a hat and a badge. He loves his hat and wears it often. 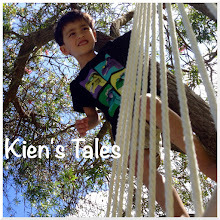 Kien brings home a lot - A LOT! of art work. Here's one of his 3D pieces. While I was sick Jef took Kien for a walk. Kien came back with these in his pocket which he collected for me. School photos last week so I did Kien's hair (after I blow dried it and combed out a bunch of lice eggs - gross). He wouldn't stand still for a pic either but I managed to get one that was not blurry. He came home from school on Tuesday and did some earning for points that he can spend on rewards. I managed a walk during my lunchtime at the beginning of the week when the weather was lovely. Walked around the viaduct area. Beautiful cloud formation one night out walking. Koala is never far way.